Following a comment on the Rollcall download about making a GUI to help create the ADF files, one is now underway and in development. Three hours work last night and it's reading in files, spotting errors and outputting most of the content back. It should need another half hour to output all content, and then I just need to work out how best to make it editable! 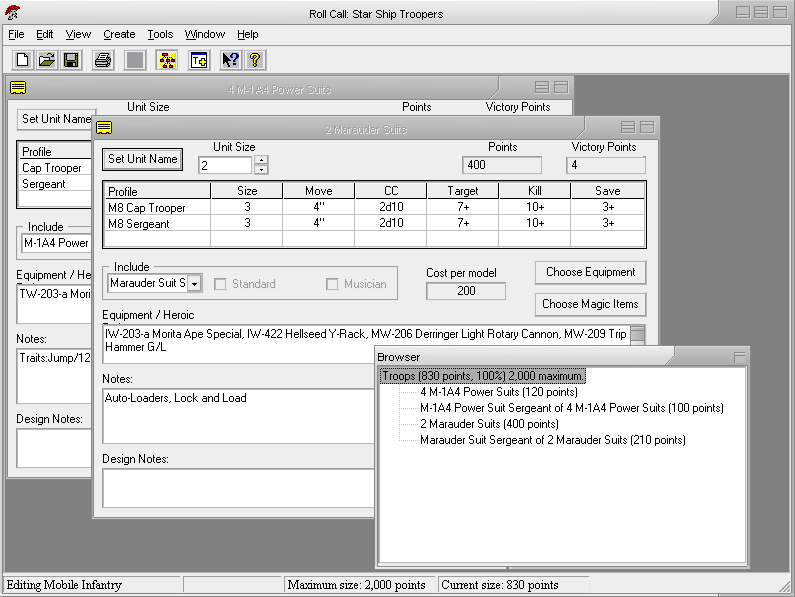 Rename Magic Items and MagicItems.txt through the config file so that, for example, Starship Troopers can have a HeroicTraits.txt file with all buttons etc referencing to it as "Heroic Traits"
Last edited by IBBoard on 31 Jan 2010, 15:41, edited 9 times in total. The content is now being displayed in lists, and the editing interfaces are starting to take shape. Also, the Rollcall list has come up with a few more things that GW seem to have complicated when they released later 6th Ed armies books. Obviously MudiPaws worked off the Ravening Hordes list and the initial 6th Ed release. 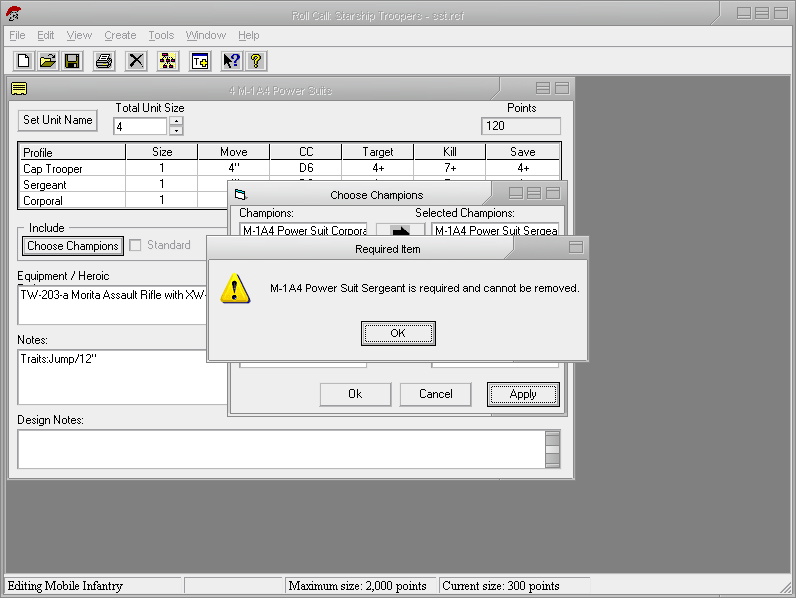 OK, there's a delay in the file creator while I update Rollcall. I thought I was making progress, but an ad-hoc approach leaves problems with even simple things like categories (mainly because you can re-order them and delete them) so I've got to sit down and think it out properly. For now, it's time to poke the Rollcall source code and see if I can put some of these extra fixes in. Last edited by IBBoard on 16 Apr 2006, 19:28, edited 1 time in total. A quick bit of work before I get down to revision this morning (damned final year exams!) and new config values have now been added for "UsesMagicItems" so games like 40K don't need a blank MagicItems.txt file as well as three types of Stat - Roll, Inches and Number - which will help with other games where stats (other than save) may be 4+ or 6" etc. ArmyStyle has now been added in to the Config so you can set it up as Roster (40K style), Slots (Warhammer style) or Percentages (old Warhammer style). They don't actually do anything yet, though. 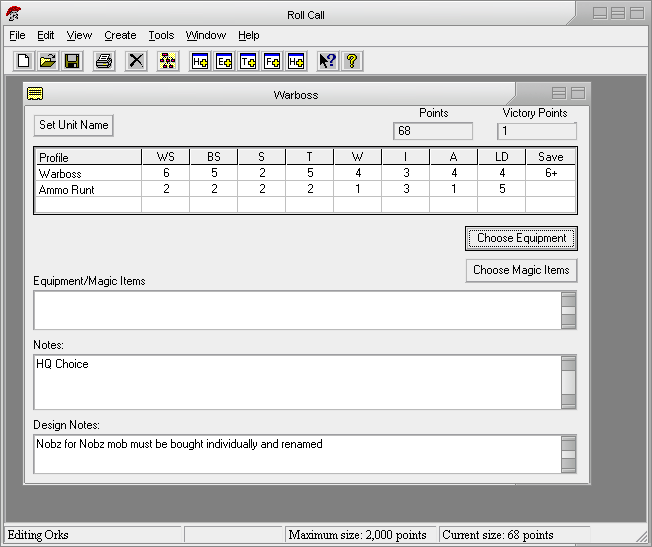 The Rollcall app should now support printing of different stat lines, although I've yet to test it out. Print Preview would be great, but it appears it's somewhat long-winded in Visual Basic, so it is being demoted down the list of features to add. OK, large amounts of work have now been done. Army styles now have an effect (they change the display of the army tree). 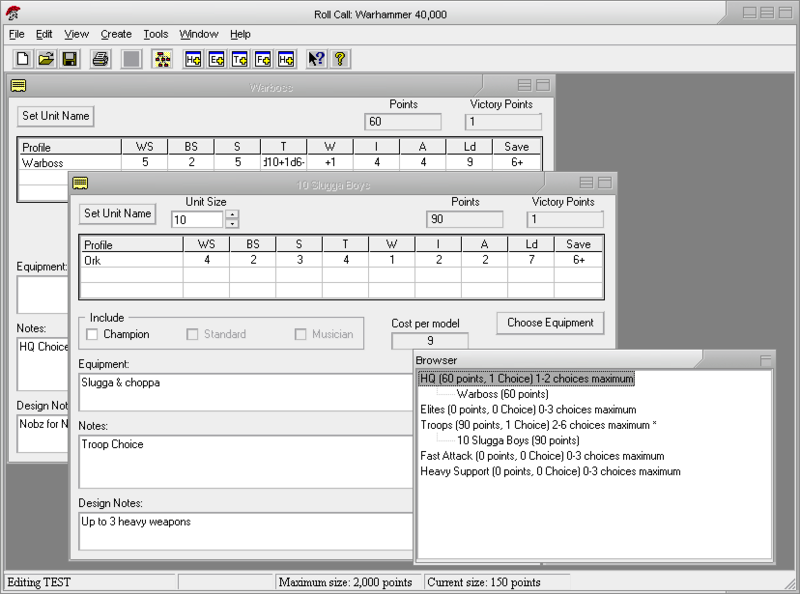 Warhammer 40K-style armies can display limits of min and max number of units per category (for now only working on one roster sheet), while Warhammer FB-style armies have calculable limits based on the maximum army size. Some testing still needs to be done on the Warhammer version, though. Units can now be assigned to multiple categories, and take a set number of slots in that category (defaulting to one). 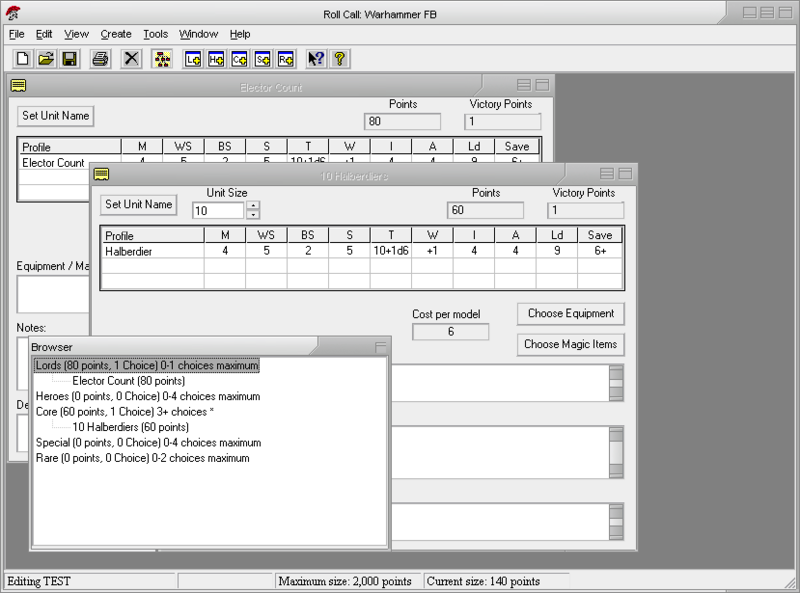 This is useful for things like Warhammer Special Characters who might take up a Lord and three Hero slots. The WarnOnInvalid setting also has an effect now - making some of the army limit breeches more obvious, and affecting whether it stops you adding too many units or units that don't have all their requirements fulfilled. I'll check some of the other settings it should affect later. Sub Armies now also work, so you can have BitCode 2 in the W40K army assigned to Space Marines and then have Codex Space Marines taking SubID 0, Blood Angels taking SubID 1, Dark Angels taking SubID 2, etc. The SubIDs also work across saved files as well, so creating a specific Blood Angels army and opening it again will result in the Blood Angels ADF being opened instead of whichever Space Marine ADF file the program finds first. Some demo screenshots are below. Ignore the stat lines, I keep playing around with them to test compatibility with games like Star Ship Troopers. Now that my Final Year Project is handed in, I'm trying to do a bit more development work. Last edited by IBBoard on 31 Jan 2010, 15:41, edited 1 time in total. I've now added RequiredChampion to the ADF files, and it appears to be working. 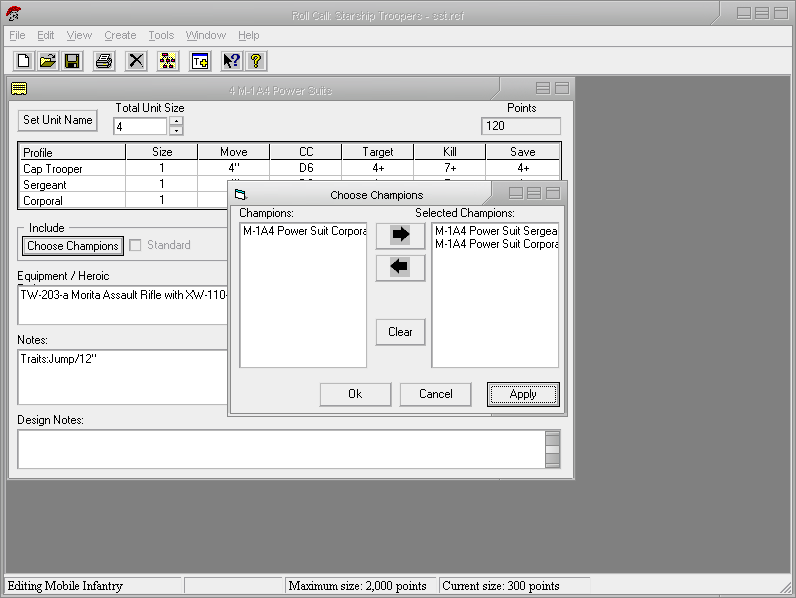 Next up are "alt stats" so that the Mobile Infantry can have mixed Marauder versions in a squad (M8 and M9). 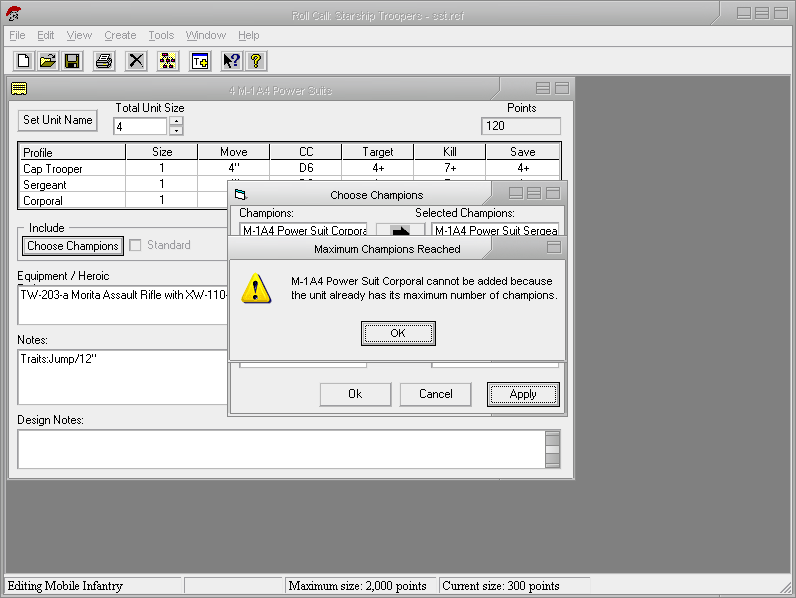 I'm sure other units have mixes too, so hopefully it'll all prove useful. Or there would have been all that work coded, only Visual Studio just crashed and it turns out that, unlike Visual Studio .Net, it doesn't save each time you run the program be default. I'm going to have to put all of that code back in now and remember what I did stupid Visual Studio - I've set it up 'properly' now, so it won't be an issue in future. Another hard days work on the program (including an hour or so this morning replacing everything that was lost last night) and we have yet more good progress. Required champions are now working, although it is currently only for one champion ID. Required champions are champions who cannot be removed and who are automatically added as soon as you build a unit. Also added is the option for multiple champions - not the multiple champions as it is now, where a unit can have a champion of type A or type B, but the real multiple champions that lets Starship Troopers Mobile Infantry squads take both a Sergeant and a Corporal, or to allow Slayers to have multiple Giant/Dragon/Daemon Slayers in the old-style Warhammer. Along with this is a maximum number of champions a unit can have, so they may be able to choose up to three As and up to three Bs, but be limited to three champions in total. Also added to go with the Multiple Champions is a new Champion 'Use Restriction' that gives champions all of the equipment of their unit, but lets you add equipment as well. It's only a partial feature so far and it still needs various things correcting/adding, including the fact that weapons the unit have can currently be removed from the Champion. Finally, the beginnings of an 'alternate troops' feature is being implemented. The idea is to allow a set number of troops (either some or all of a unit) to be replaced by an alternate model with an alternate stat line - e.g. M8 suits in Starship Troopers being replaced with M9 suits. This is an even more sparse implementation than the new Champion Use Restriction and needs even more work done to make it fully usable.